I have a weak spot for a Texas accent. And in the midst of a controversial presidency, I feel like I shouldn’t admit that I like to listen to Secretary of State Rex Tillerson speak because of the way that Texas sound drips from his tongue. Hmmm….this is taking a tone that is probably a little uncomfortable. So, let’s talk about a Rex Tillerson cream pie! Since Secretary Tillerson spent much of his career working for Exxon Mobile, it seems right that his cream pie would have make reference to oil. Since oil isn’t very tasty, let’s take another route. 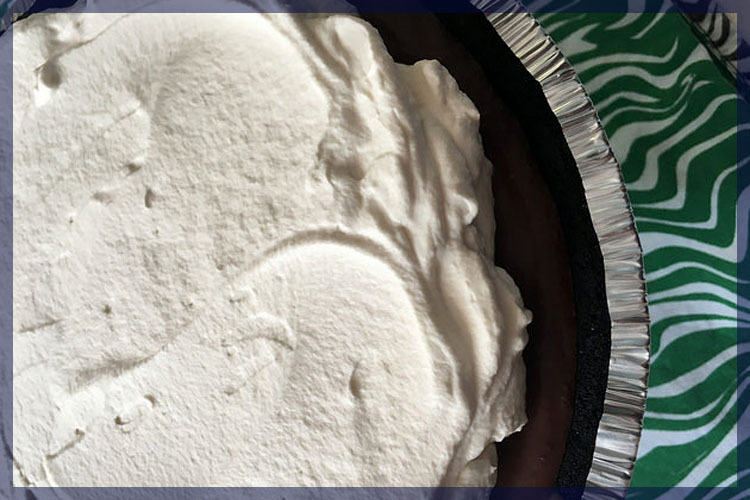 This pie has a chocolate cookie crust and an chocolate cream filling. This represents the dark color of crude oil. Between the crust and the creme is a layer of pecan butter, a reference to the southern climate that grows pecans so well. The pie is garnished with a White Russian-inspired whipped cream due to the many questions about Tillerson’s ties to Russia as he moves through his duties as Secretary of State. As Secretary of State, Tillerson is the head of the State Department, and the president’s chief advisor on foreign affairs. The department is also responsible for promoting American foreign policy around the world. For more a about Tillerson’s responsibilities and the the department he’s responsible, head over to the state department’s website. This entry was posted in Cabinet Cream Pies and tagged chocolate, chocolate cream, kahlua, pecans, Rex Tillerson, Secretary of State, Texas, vodka, whipped cream. Bookmark the permalink.